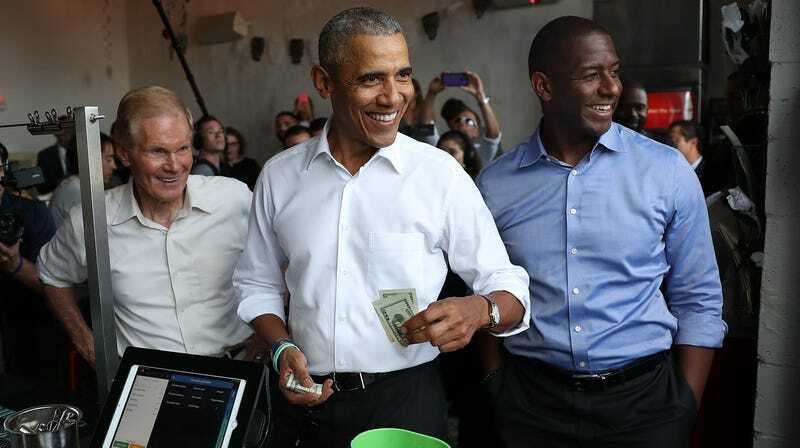 Former U.S. President Barack Obama orders lunch with Florida Democratic gubernatorial candidate Andrew Gillum and U.S. Senator Bill Nelson (D-FL) at the Coyo Taco restaurant on November 02, 2018 in Miami, Florida. He ordered the special—“Cochinita Pibil, Pollo al Carbon, Camaron, Guacamole and Esquite”—and said he was treating his friends. As he waited for his food he shared a chip with a fellow patron and wished a bride-to-be best wishes. Once his food arrived he left a generous $40 tip, and the keepsake of a lifetime for the receipt holder. Obama didn’t even take points off for his misspelled name as “Barrack” (maybe the cashier was nervous typing). By that point, word had spread of the former president’s whereabouts, and he was greeted by a large crowd as he left the restaurant before heading off to further campaigning. Please vote on Tuesday.